If like me you are cycling around on a brightly coloured Brompton - mine being a rather tasty orange is case you didn't know - you might be interested in a company called Lamy who make some rather funky fountain pens. Lamy is a German company that make some wonderful pens for all budgets and tastes. Many are regarded as design classics and they can be bought at any good stationers or pen shops. (I have included the link to their website below). Lamy Safari's in assorted colours. As you can see from the picture I have quite a soft spot for them. The orange ones are my particular favourites for some reason? (Sadly, you can't get them in that colour any more). They cost roughly £12-£14 and the really great thing is that Lamy bring out a special colour in a limited run every year. They write beautifully and with a converter you can use bottled ink of any colour you like. In addition you can get them in any nib size you care to mention and can easily buy another nib if it isn't to your liking. They are supposed to be a pen for young children but I love them as they are quite a good size for an adult hand. If the hard wearing plastic is not to your taste you can even go for an 'Al Star' which looks exactly the same as the Safari but is made out of lightweight aluminium. (The silver coloured pen in the picture at 6 o'clock is an Al Star. 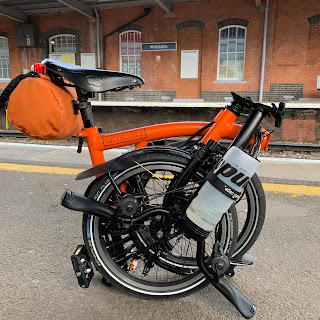 So, next time you are in London and you see a devilishly handsome chap on a tube train, with an orange Brompton in one hand and a stylish and perfectly formed orange 'Lamy Safari' in the other, say hello. If I like the look of you, I might even say hello back. I have a Lamy too. Nice, not very expensive, but great pen. Don't you love fountain pens?